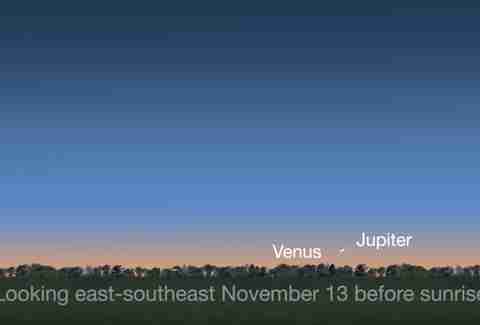 The planets will appear close together for a short time about 45 minutes before sunrise. Once the sun is up, it will obscure both planets from view. Look low on the east/southeast horizon to spot the planets converging (0.28 degrees apart). You'll want to exercise a little caution, though. The planets will be visible to the naked eye, as they're both quite bright. Looking through a telescope will give an impressive view of the planets as well. However, the event will happen close to sunrise, and you definitely don't want to point a telescope or binoculars at the sun. You don't even want to stare at the sun, which should seem obvious, but August's eclipse proved it's worth repeating. The conjunction -- the term for when the orbits of two planets align when viewed from Earth -- will actually take place around 1:05am ET, reports Space.com. 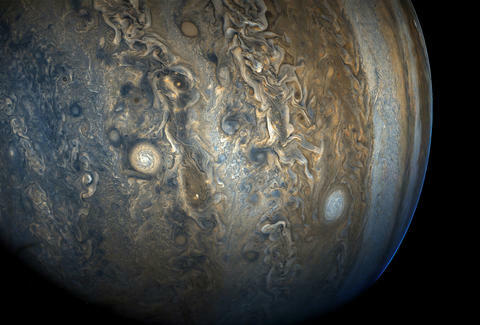 Unfortunately for readers in the US, Venus and Jupiter will not yet be visible in the sky. They'll rise on the east coast around 5:30am, and on the west coast around 5:18am. Across the US, sunrise will take place between 6:10am and 7:20am. For the best view, pick a place away from city lights. That's always helpful when you're looking up into the night sky. Additionally, since the event will take place so low in the sky, you'll want a view with a flat, unobstructed horizon. If you're planning to go out and hate bitter disappointment early in the morning, Accuweather has a look at visibility conditions across the country during the brief window in which you can view the conjunction.